Sunless Sea, Failbetter’s eldrich nautical sandbox, is very good. It’s not finished yet, but it’s still worth buying and diving into. I wrote words about it in my Sunless Sea Early Access review, and some of those words detailed the sedentary battles. They were not-quite-turn-based affairs, and their premise – that before you shoot a ship or undersea beasties, you must illuminate it – was a bit more interesting than their execution. But as Early Access games are wont to do – though not as frequently as one might expect/hope – Sunless Sea is going through some big changes. The old combat system is being thrown overboard, and its replacement is quite a different animal. 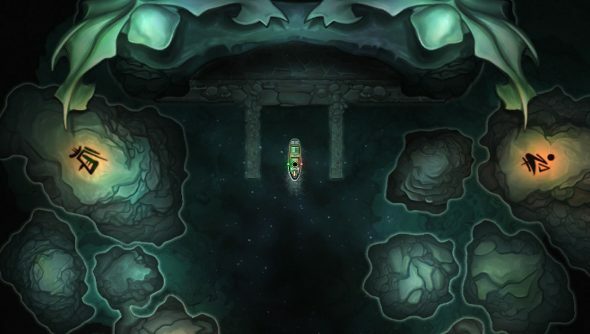 Nautical scraps in Sunless Sea will now be real-time battles set on the map of the cavernous, underground ocean. Failbetter promises that it will still be gently paced, pausable and will still be built on the concepts of light and darkness. So playing ability cards on cooldowns are out; fighting on the map, employing “primary game systems” is in. While the semi turn-based combat seems to fit the relaxing pace of Sunless Sea, it was extremely predictable, with each battle playing out in more or less the same way. I think it could have been improved without a complete overhaul, but I must say I also like the idea of it being better integrated, playing out on the map and using skills one has already learned during their time at sea.